Going down memory lane, one cannot forget a name that was synonymous with school cricket in Ceylon, in the late fifties and early sixties. Tyrone Le Mercier was a household name having started his cricket career early in life playing for St. Peter’s College, Colombo in 1959 at age 16. He eventually captained the Peterites in 1963. In an interesting bit of trivia, Tom Le Mercier, Tyrone father was No.4 batsman for the invincible Josephian team in 1933 under Robert Fernando. Le Mercier senior was a batsman and did not bowl and scored 32 runs in the 1933 “Big Match”. The Josephians won this game by an innings and 105 runs. One must remember that school cricket was very competitive at the time and the standard of cricket was very high. Most schools had players who went on to represent clubs at the premier “Sara Trophy” level and also nationally. Names that come to mind include Michael Tissera, Anura Tennekoon, Sarath Seneviratne, L.S. Perera, Ronnie Reid, Lareef Idroos (S. Thomas’); David Heyn, Anton Perera, Premasiri Athukorale, Richard Heyn, Adiel Anghie (St. Peter’s); Yatagama Amaradasa, T.D. Rajapaksa, Mohanlal Fernando (Ananda); Nihal Amaradasa (Nalanda); Lorensz Pereira, Darrel Lieversz, S.S. Kumar, Michael Dias, Vijay Malalasekara, Chanaka de Silva (Royal); Priya Perera, Raja de Silva, Tissa de Soysa, Hillary Marcelline, Brian Perumal (St. Joseph’s); Charlie Joseph, Bunny Stevens, Michael Raj, Michael Joseph (St. Anthony’s); T.B. Kehelgamuwa (Dharmaraja); Sarath Wickramaratne, Darrel Maye, Raja Athukorale (Wesley), Sunil Perera, M.T.M. Zarook, Jayantissa Ratwatte (Trinity); Ranjith Fernando, Sunil Fernando, Felix Dias, Neville Casiechetty, Elmo Rodrigopulle (St. Benedict’s) and many others. Getting back to Tyrone Le Mercier, it was 1959 as a 16-year old he had his baptism to school cricket when he was picked as a leg spinner for St. Peter`s College who had a terrific team that year. Le Mercier bowled left-arm but batted right hand and had a good season but really shone at the Silver Jubilee “Josephian-Peterite Big Match” under the captaincy of Brian Seneviratne. Others in the Peterite team were Richard (Dicky) Alles, Mark de Silva, Randy Layman, Premasiri Athukorale, Adiel Anghie, Richard Heyn, Anton Perera, Desmond Dharmarajah, and Elmo Gunasekara. 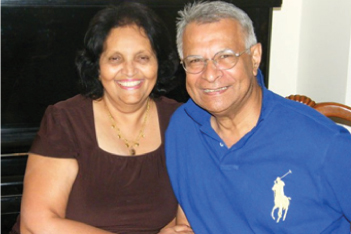 The Josephians were led by Claude Perera and included among others Hilary Marcelline, Primrose Fernandopulle, Raja de Silva, Tissa de Soysa, Priya Perera, Travis Perera, and Kumar Amarasekara. The match ended in a draw but is best remembered for a brilliant spell of spin bowling by 16-year old Tyrone Le Mercier who picked up six wickets for 30 runs in 17.3 overs against a strong Josephian batting line-up. He had the wickets of top batsmen Raja de Silva, Tissa de Soysa, Priya Perera, Travis Perera and Lucky Fernando. Le Mercier swiftly demolished the top order batsmen and the Josephians were back in the pavilion for 157 runs with skipper Claude Perera (26), Hilary Marcelline (55) and Primrose Fernandopulle (20) entering double figures. The Peterites replied with 161 runs for 9 wickets with Richard Alles (38), Mark de Silva (60) and Richard Heyn (26) been the chief scorers. The Josephians, in their 2nd innings declared at 111 for 7 wickets leaving the Peterites to make 107 runs in about 17-overs. Le Mercier had 2 for 26 in 14-overs and a match bag of 8 wickets in his very first “Big Match”. More importantly though was the fact that he signalled to other schools a naturally gifted ‘leg-spinner’ was born. Getting back to Tyrone Le Mercier, it was 1959 as a 16-year old he had his baptism to school cricket when he was picked as a leg spinner for St. Peter`s College who had a terrific team that year. Le Mercier bowled left-arm but batted right hand and had a good season but really shone at the Silver Jubilee “Josephian-Peterite Big Match” under the captaincy of Brian Seneviratne. Others in the Peterite team were Richard (Dicky) Alles, Mark de Silva, Randy Layman, Premasiri Athukorale, Adiel Anghie, Richard Heyn, Anton Perera, Desmond Dharmarajah, and Elmo Gunasekara. The Josephians were led by Claude Perera and included among others Hilary Marcelline, Primrose Fernandopulle, Raja de Silva, Tissa de Soysa, Priya Perera, Travis Perera, and Kumar Amarasekara. The match ended in a draw but is best remembered for a brilliant spell of spin bowling by 16-year old Tyrone Le Mercier who picked up six wickets for 30 runs in 17.3 overs against a strong Josephian batting line-up. He had the wickets of top batsmen Raja de Silva, Tissa de Soysa, Priya Perera, Travis Perera and Lucky Fernando. Le Mercier swiftly demolished the top order batsmen and the Josephians were back in the pavilion for 157 runs with skipper Claude Perera (26), Hilary Marcelline (55) and Primrose Fernandopulle (20) entering double figures. The Peterites replied with 161 runs for 9 wickets with Richard Alles (38), Mark de Silva (60) and Richard Heyn (26) been the chief scorers. The Josephians, in their 2nd innings declared at 111 for 7 wickets leaving the Peterites to make 107 runs in about 17-overs. Le Mercier had 2 for 26 in 14-overs and a match bag of 8 wickets in his very first “Big Match”. More importantly though was the fact that he signalled to other schools a naturally gifted ‘leg-spinner’ was born. Le Mercier played in the 1960 Peterite team under Premasiri Athukorale; in 1961 under Adiel Anghie; 1962 under Richard Heyn and captained in 1963. Sadly the “Big Match” was drawn and the Peterites did not enjoy a victory lap from 1959-1963. But these golden years produced some of the best Peterite cricketers who went on to make a mark in Ceylon, U.K., and Australia. Tyrone Le Mercier had the distinct pleasure of playing alongside greats like Darrel Wimalaratne, David Heyn, Richard Heyn, Maurice Deckker, Peter de Niese, Travis Fernando, Tissa Jayaweera, Rohan Abeysundera, Richard Alles, Didacus de Almeida, Premasiri Athukorale, Adiel Anghie, demon fast bowler who now lives in Los Angeles Anton Perera, Randy Layman, Brian Seneviratne, and Desmond Dharmarajah. Sadly, to my knowledge some of these players (Darrel Wimalaratne, Richard Alles, Didacus de Almeida, Premasiri Athukorale, Brian Seneviratne) are no more and may their souls rest in peace! Tyrone Le Mercier was best known as a wily left-arm spinner but over time developed into a reliable middle order right-hand bat. In 1960, he was picked “Best Schools’ Bowler” over Priya Perera (SJC), Yatagama Amaradasa (Ananda), M.L. Idroos (S. Thomas’), and Anton Perera (SPC). Dashing Ananda all-rounder Yatagama Amaradasa was picked `Schoolboy Cricketer of the Year“ that year. In 1960 and 1961, Antonian cricketer Charlie Joseph was chosen “Schoolboy Cricketer of the Year”. Following is a compilation of Peterite batsmen who have scored over 150 runs in one inning. Interesting to note that Angelo Perera (4) and Clive Inman (2) are the only Peterites batsmen who had more than one score of 150 runs in their school career. Tyrone Le Mercier is the second highest scorer among the Peterites so far.